Neil Seery: "A Lot of Fighters Are Living Beyond Their Means"
Neil ‘2 Tap’ Seery, Patrick Wixted and Jack Sheridan are working in a small Octagon that greets me as I enter Team Ryano’s premises in North Dublin. Seery cycles between throwing combinations into the pads that Sheridan holds, to fighting off the grappling advances of jiu-jitsu brown belt, Wixted. At 36 years of age, Seery still isn’t missing a beat with the promising Dublin prospects. He looks as energetic as ever as he prepares for what is the biggest fight of his career against Kyogi Horiguchi, who he meets on May 8 in Rotterdam. The UFC flyweight has given his life to combat sports, but famously, he still doesn’t designate all of his time to his fighting career. 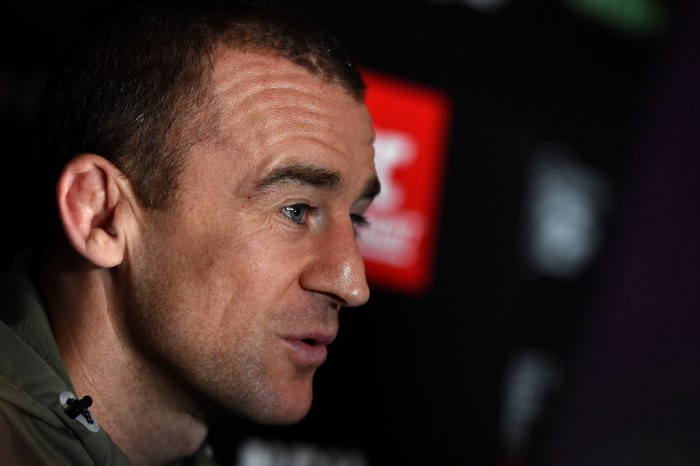 Remaining in the full-time employment that he had when he signed on the dotted line for UFC, Seery has no plans of leaving his job anytime soon. Having waited five months to have his next opponent announced after his second round submission win over Jon Delos Reyes in Dublin last October, Seery believes there would be no way to provide for his family if he didn’t keep up his work outside of MMA. “People think once you get to the UFC you’re made for life,” he tells me when the training session is over. “I’ve had five fights in the UFC, I’m about to have my sixth, but there’s not a chance in hell that I’d be able to pay my mortgage for the year and support my family off that. “There are a lot of people that just shut themselves down, they think this is all they need. They think they’re set and that they’ll be doing fine in 10 or 15 years. Who even knows if the UFC is going to be around in ten years? There are no guarantees in the fight game. “Providing that you hit the top, then maybe you can have plenty of money when your career is over. But even at that, I’ve seen millionaires go broke over night. “A lot of the fighters are living beyond their means and they haven’t seen the downside of it yet. When the money stops coming and the fights aren’t coming anymore, they won’t know what to do. “What do you do, though? You can’t walk into a company at 30 years of age and tell them you want a job. You might have trained full time for ten years, but you’ve never worked. You might have worked in the gym, but that’s no going to give you experience to walk into any job outside of the fight game. “There are only a handful of people that make enough money to live like a superstar all year long in MMA. They have the type of money where they can just decide to not fight anymore. “You have to compete at the highest level to understand how it feels after a big win. You do that press conference and then the buzz is gone. Nobody knows how bad it can be when you come down off that massive adrenaline rush. “To understand it you have to live through the buzz of fight week. It’s the buzz of the weigh ins, the buzz of the fight itself and then the buzz off the crowd when your name gets announced out as the winner. It’s the greatest feeling in the world, but there is a crash. The only way you can even come close to feeling that again is by watching it again, but it is still is nothing compared to the real thing. “Throughout your preparation all you think about is the fight. You gear everything in your life towards that moment. Then when it’s over, it almost feels like there is nothing else to look forward to. “A lot of people give me stick because I go back to work, but what else do they want me to do? You can’t try to keep that euphoria going for a year. You’d end up dead. Even if you go back to the gym on the Monday after a fight it’s not the same feeling.